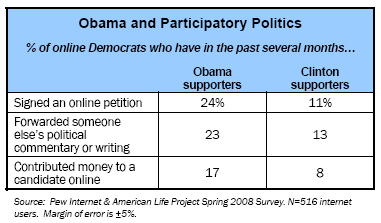 Younger online political users tilt in favor of the Democrats in general and Obama in particular, and that has a bearing on the partisan breakdown of online activity. Simply put, Democrats and Obama backers are more in evidence on the internet than backers of other candidates or parties. Among Democrats, Obama’s supporters are more likely than Clinton’s supporters to be internet users—82% vs. 71%. And even among the internet users in both camps, Obama’s supporters are more actively engaged online than Clinton’s supporters—three-quarters of online Obama’s supporters (74%) have gotten political news and information online, compared with 57% of online Clinton’s supporters. In a head-to-head matchup against Republican John McCain in the fall, Obama also has some online advantages. Obama and McCain supporters are equally likely to use the internet, but some 65% of online Obama’s supporters in a fall contest say they get political news and information on the internet, compared with 56% of online McCain’s supporters. 78% of Republicans, 74% of Democrats, and 76% of independents go online. Among internet users, 55% of Republicans, 61% of Democrats, and 56% of independents look online for news about politics or the 2008 campaigns. Overall, 49% of Republicans, 50% of Democrats, and 48% of independents use the internet, email, or text messaging to learn about the campaign and engage in the political process. Yet despite these outward similarities, wired Democrats are outpacing online Republicans in their usage of the internet for political reasons—from social networking to watching online video to contributing money online to signing up for campaign-related email. In large part, these differences result from the relative youth of those who self-identify as Democrats. Young Democrats and Republicans utilize tools such as online video at similar rates, but this youthful, tech-savvy cohort of voters makes up a larger proportion of all Democrats. The relatively small sample of wired Democrats in our survey prevents a robust age-based analysis of Obama and Clinton supporters, although a similar phenomenon is likely in evidence within the Democratic primary race. 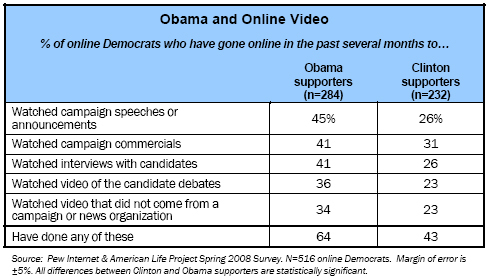 Obama supporters outnumber Clinton supporters in their use of online video for political purposes. At this stage in the election, Democrats and independents are making greater use of online video sites as sources of political information. Half (51%) of wired Democrats and independents have watched at least one type of political campaign video, compared with 42% of wired Republicans. Among Democrats, Obama supporters outpace Clinton supporters in their use of online video sites for political material. Among Democrats who go online, Obama’s supporters are more likely than Clinton’s supporters to watch campaign speeches and commercials, candidate interviews, debates and video from outside the campaigns or news organizations. Because Obama’s supporters are more likely to go online to look for political information in the first place, these differences are even greater when comparing all Clinton and Obama supporters. When paired in a head-to-head matchup with McCain, Obama still maintains clear advantages with respect to online video. Compared with those who would support McCain in a head-to-head matchup in the fall, wired Obama supporters are more likely to go online to watch campaign commercials (36% vs. 26%), candidate debates (29% vs. 21%), interviews (32% vs. 25%), and speeches or announcements (35% vs. 25%). More often than Republicans, Democrats are bypassing the traditional media and the campaigns themselves to seek out raw campaign material such as speeches, position papers, and video of debates online. Fully 45% of online Democrats have done at least one of these activities thus far in the campaign cycle, compared with 34% of Republicans. Among Democrats, Obama’s supporters are leading this charge—57% of wired Obama supporters have sought out this type of information online, compared with 38% of online Clinton fans. Obama supporters also lead the field in their use of “Politics 2.0” online tools. In a head-to-head matchup with Republican McCain, Democrat Obama has similar advantages: among those who go online, his supporters are more likely to sign an online petition (18% have done so, compared with 11% of McCain supporters), sign up to receive emails from the candidates or campaigns (17% vs. 8%), contribute money online (13% vs. 5%), to post their own political commentary or writing (8% vs. 4%), and volunteer online for activities related to the campaign (5% vs. 2%). While Clinton’s online advantages are not as clear cut, her supporters are more likely than McCain’s supporters to sign up for candidate emails (16% vs. 10%) and to sign up online for campaign-related volunteer work (5% vs. 1%). Democratic supporters of both Clinton and Obama outpace Republicans in their adoption of social networking. More than one-third of online Democrats (36%) have a profile on a social networking site, significantly greater than the comparable figures for both Republicans (21%) and independents (28%). Interestingly, despite the pronounced age differences between Obama and Clinton partisans, the percentage of internet users in each group who have a social networking profile are within the margin of error for this survey (38% of online Obama supporters and 31% of online Clinton supporters have a social networking profile). 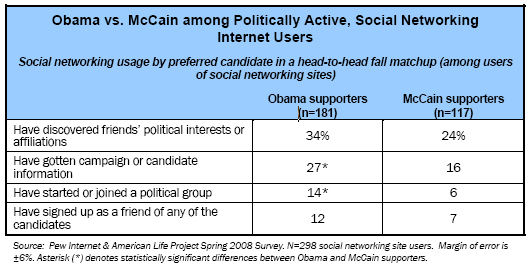 While the sample size of social networking Democrats is too small for a robust comparison of Clinton and Obama supporters on this issue, Obama’s supporters are clearly more politically active social networking users than McCain’s supporters when the two candidates are compared head to head.